We received a delivery of rolls and rolls of canvas we just began using. 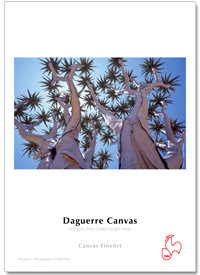 The Daguerre Canvas from Hahnemühle is a 400 gsm acid-free poly-cotton canvas, excellent for archival quality fine art giclees, particularly when combined with our large format pigmented inkjet system. Hahnemühle has been producing fine art paper since 1584, when Merten Spieß established a paper mill, Relliehäusische Papiermühle, in Solling, Germany—so you know their quality is renowned in the business! Contact us at info [at] Canada On Canvas [dot] com if you'd like a sample of the Daguerre Canvas from Hahnemühle mailed to you!